The familiar culinary plants onions, leeks, garlic and chives are all members of the genus Allium, which comprises approximately 750 species. You can recognise Allium species by the characteristic onion or garlic smell they emit when cut or otherwise damaged. 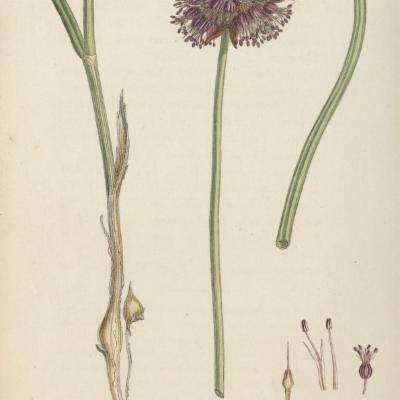 A threatened species in the UK, the round-headed leek belongs to the same genus as the familiar culinary plants onions, leeks, garlic and chives. Round-headed leek can become a weed, spreading vegetatively via its bulblets or by bulbils in those forms that possess them. 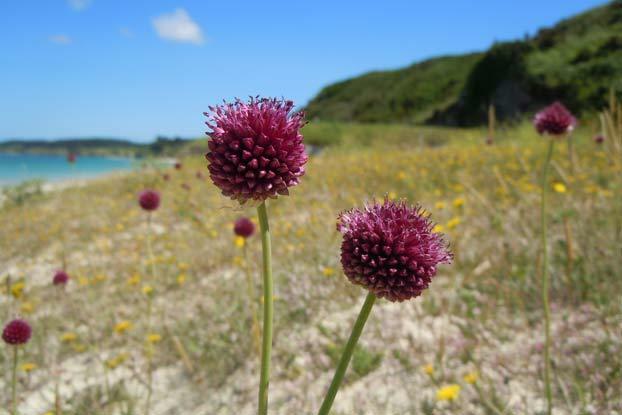 Four subspecies of Allium sphaerocephalon are recognised. Most individuals belong to subspecies sphaerocephalon. White-flowered plants from Mediterranean islands and the Balkans with smooth flowers belong to subsp. arvense, while those from Greece and south-west Turkey with papillose flowers (with a roughened surface) belong to subsp. trachypus. Allium sphaerocephalon subsp. laxiflora is restricted to Sicily. Bulbil-bearing forms belong to subsp. sphaerocephalon, and are sometimes referred to as var. bulbilliferum. The round-headed leek is found throughout Europe as far east as the Ukraine, southern European Russia and the northern Caucasus but not in Scandinavia. It is also found in the Canary Islands, North Africa, many Mediterranean islands and north-western, western and southern Turkey, as well as Syria, Lebanon, Palestine and Kuwait. 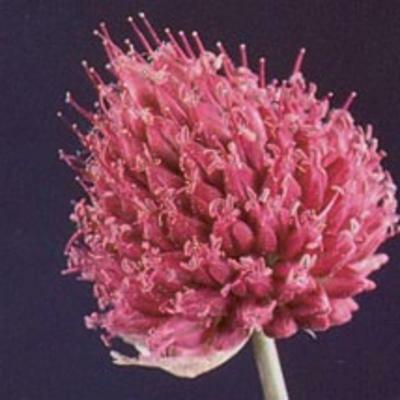 The round-headed leek has small underground bulbs (to about 2.5 cm in diameter) which often divide into bulblets inside the brown bulb skin or tunic. It has a stem, unlike some onion species, which can be as much as 90 cm long, and bears 2-6 sheathing leaves which are 1-4 mm wide, round in cross section and hollow. The umbel tops a scape or inflorescence stalk, is usually 2-3.5 cm in diameter, and usually made up entirely of flowers. Like some Allium species, however, forms with bulbils (small, usually round vegetative propagules) in the inflorescence can be found. Before the flowers open, the umbel is surrounded by thin, papery bracts called spathes. The ovary is superior, which means that the six tepals are attached at its base. 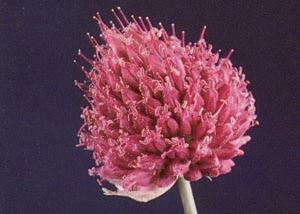 The round-headed leek belongs to a large group of Allium species in which the anthers have an additional pointed branch on either side of the stamen. It is distinguished by tight spherical or egg-shaped umbels of flowers with spathes that split into 2-4 parts and point down towards the ground. In cultivated plants the flowers are normally dark purple but, in the wild, pink and white forms are known. The reproductive parts emerge conspicuously from the flower. In fruit, the dry capsule contains many small, angular black seeds. 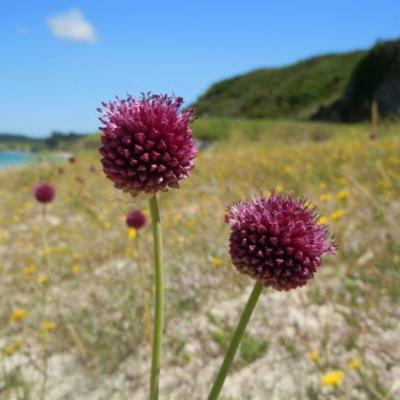 In the UK, this species is listed as Vulnerable (VU D2) because it is limited to a single population of less than 1,000 individuals in the Avon Gorge (in the Bristol area it is apparently known as the St Vincent's rock leek as this is where it grows). Its wide distribution across Europe, North Africa and western Asia and its sometimes weedy nature suggest that from a broader viewpoint it might be categorised as Least Concern (LC). The bulb is edible and is reported to have been eaten in the Lake Baikal region of Siberia since early times. The leaves can also be eaten raw or cooked. The sap is used as a moth repellent and the whole plant is said to deter insects and moles, although the flowers are very attractive to bees. Round-headed leek is a very attractive and easily grown ornamental which can be used as a dried plant in flower arrangements. Fourteen collections of Allium sphaerocephalon are held in Kew's Millennium Seed Bank based at Wakehurst in West Sussex. Round-headed leek is easy to grow. The bulbs should be planted fairly deeply, in a light well-drained soil in a sunny position. Once established the plants are fairly drought-tolerant. It grows well with most plants, especially roses, carrots, beet and chamomile, but it inhibits the growth of legumes. It should not be planted near alfalfa, as each species affects the other negatively. Plants often divide freely at the base. In scrubland, on dry rocky or stony hillsides or on beaches. A weed in cultivated localities, on roadsides and waste land. Vulnerable D2 in the UK. Allium species can cause digestive problems in humans if eaten in large quantities, and raw onion is poisonous to cats and dogs. Aedo, C. (2006 publ. 2007). Is Allium ebusitanum (Alliaceae) an endemic species of Ibiza? Anales del Jardin Botanico de Madrid 63: 121-130. Mabberley, D. J. (2008). 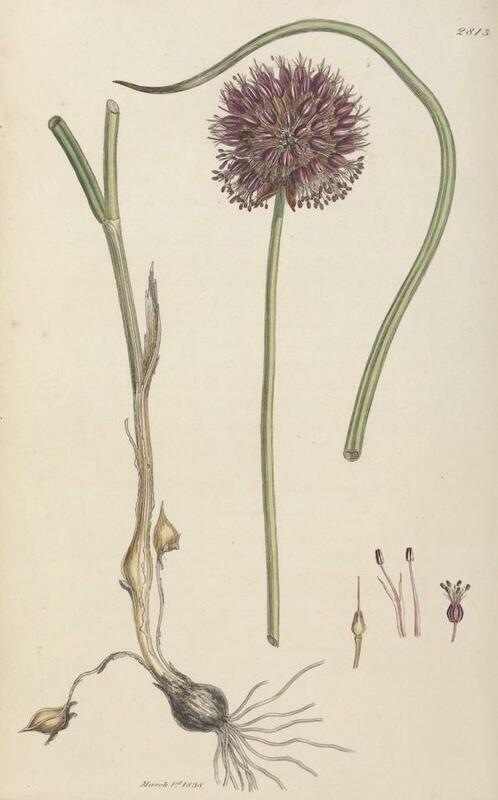 Mabberley’s Plant-Book: A Portable Dictionary of Plants, their Classification and Uses. 3rd Ed. Cambridge University Press. Cooper, M. R., Johnson, A. W. & Dauncey, E. A. (2003). Poisonous Plants and Fungi: an Illustrated Guide. 2nd Ed. TSO, London. Mathew, B. (1996). A Review of Allium Section Allium. RBG, Kew. Hedrick, U. P. (ed.) (1919). Sturtevant’s Notes on Edible Plants. New York (State) Dept. of Agriculture, 27th Annual Report, Vol. 2 Part II. Lyon, Albany. Vascular Plants Red Data List for Great Britain.